The paper is devoted to the mathematical modeling of the problem of two metal plates impact using two approaches. In the first approach, the problem is solved using three-dimensional Euler equations and the stiffened gas equation of state for the media. The parameters of the equation of state are calibrated using wide-range equations of state computations of the parameters of shock waves which form after the impact. The second approach is based on one-dimensional two-fluid seven-equation model. In simulations of metal plates impact, we get two shocks after the initial impact that propagate to the free surfaces of the samples. 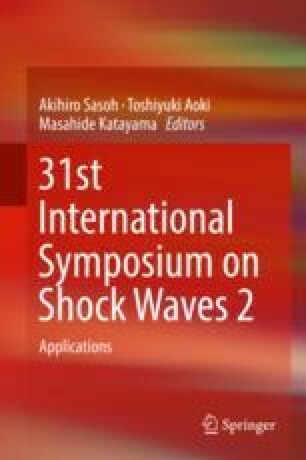 The characteristics of shock waves are close (maximum relative error in characteristics of shocks is not greater than 7%) to the data from the wide-range equations of states computations.